Mattel finally joined the 21st century last month with a new line of Barbie dolls that features diverse body types. But Nickolay Lamm’s Lammily doll had the jump on the toy giant by a couple of years with his doll designed with the measurements of an average teen girl, and Lamm is even credited with being an influence on Barbie’s evolution. Now he’s turning his focus to Barbie’s male counterpart, Ken. Currently in the crowdfunding stage, the boy Lammily, who comes dressed in a plaid shirt and jean shorts with loafers, was created using anthropometric data to be realistically proportioned to represent the average 19 year-old male. 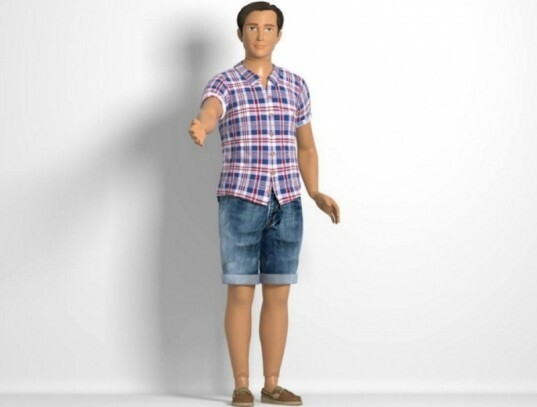 Although it’s Barbie who is usually at the center of discussions regarding doll-playing and body image, Lamm argues that the unrealistic proportions featured on male dolls like Ken also impacts men and boys and says that he personally struggled with body image issues in high school. Learn how the male Lammily doll differs from Mattel’s Ken doll after the jump. 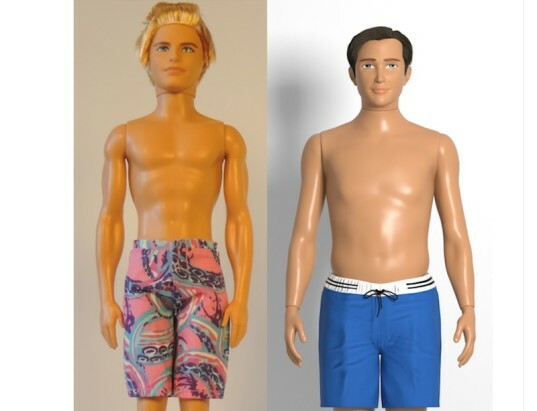 The male Lammily or “real Ken” as he has been nicknamed, is currently in the prototype stage, but the differences between him and a typical Ken doll are immediately evident. The male Lammily is without a chiseled six pack and bulging biceps, and his waist and hips look normal, although they are both a far cry away from Dadbod Ken. Honestly, when you look at them side-by-side, Ken’s body parts looks grossly disproportionate, so the Lammily doll already accomplished one purpose of pointing out how ridiculous the Barbie proportions are for both men and women. With the tagline “Real is Beautiful,” the campaign for the new doll focuses on the Lammily’s inner qualities such as his sense of humor, big heart, strong sense of self, and respect for others. On the physical front, he does feature articulated elbows, hands, knees, and feet, making him more active than a typical doll. The male Lammily dolls will come with a storybook pamphlet detailing the doll’s backstory, but we’re pretty sure your kiddos won’t have any trouble creating imaginative scenarios and incorporating this more realistic doll into their play. I say “more” realistic because, even though Lamm uses actual physical data from 19 year-olds, the male Lammily still looks pretty well-maintained and boasts piercing blue eyes, well-defined features, and a shock of thick, dark hair (Lamm did mention that the creation of a male Lammily with male pattern baldness could happen in the future). Still, this new realistically proportioned doll is an encouraging option for the millions of young boys and girls out there for whom doll play is a daily activity, and its creation will hopefully encourage more boys to explore this form of creative play. Mattel finally joined the 21st century last month with a new line of Barbie dolls that features diverse body types. But Nickolay Lamm's Lammily doll had the jump on the toy giant by a couple of years with his doll designed with the measurements of an average teen girl, and Lamm is even credited with being an influence on Barbie's evolution. Now he's turning his focus to Barbie's male counterpart, Ken. Currently in the crowdfunding stage, the boy Lammily, who comes dressed in a plaid shirt and jean shorts with loafers, was created using anthropometric data to be realistically proportioned to represent the average 19 year-old male. Although it's Barbie who is usually at the center of discussions regarding doll-playing and body image, Lamm argues that the unrealistic proportions featured on male dolls like Ken also impacts men and boys and says that he personally struggled with body image issues in high school. Learn how the male Lammily doll differs from Mattel's Ken doll after the jump.